This article will explain the different views available in the Input Editor of Modo. You can edit the default keyboard shortcuts, and add new shortcuts, through the Input Editor within Modo, which can be found under the System menu. Context: This view allows you to specify the context within Modo that the shortcut will be accessible in. The options for this view include restricting the shortcut to Item or Component mode, or restricting it to a certain layout. The option (contextless) will apply the shortcut without a context, allowing it to be used in either mode or any layout. However, if the input has another command set to it with a context applied, this will take priority over the contextless command. Keyboard Shortcuts: This filter lists all the current shortcuts. By expanding the drop down menu in the Trigger column, you can see any specific viewport parameters that this input has a command set in. 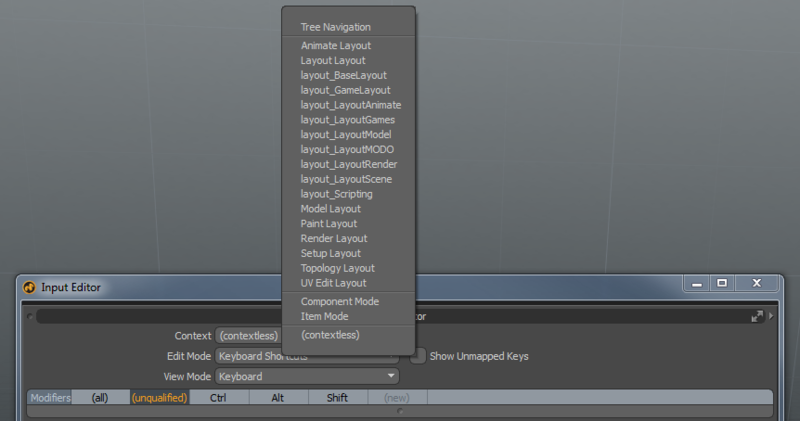 Viewports: This filter will allow you to see all the current shortcuts specific to a certain viewport in Modo. For example, the Schematic viewport, or the Graph Editor. Tools: This filter allows you to view specific modeling, painting and sculpting tools such as the Airbrush, Mirror or Edge Bevel tool. Mouse and Keyboard: This filter will list the input results by Mouse and Key inputs. Commands: This filter will list the input results by grouping them into relevant sections, such as 'Modeling', 'Render' or 'Items'. This filter works best with the Keyboard Shortcuts Edit Mode. NOTE: Currently, only the 'Categories' Commands by Group option will generate results. Actions: This filter will list the current actions set up, specific to the Tool or Viewport defined in the Edit Mode. It is not accessible for the Keyboard Shortcuts Edit Mode. Modifiers: The Modifier parameter is found above the view columns, visible when using the Keyboard Shortcuts Edit Mode and the Keyboard View Mode. This parameter allows you to quickly filter the listed inputs by modifier keys. Show Unmapped Keys: This option is found to the right of the view parameters. By checking this option, all mouse and key combinations will appear in the view results, even if they do not have an active command or action assigned.